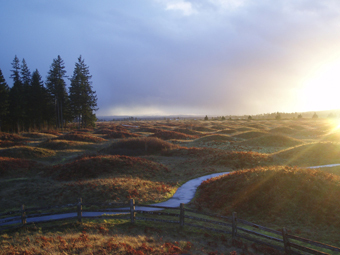 Every year, ten thousand people visit Washington’s Mima Mounds Natural Area Preserve to marvel at the many rare plant and animal species living on its 625 acres. Coming into existence over 7000 years ago, it is one of the last remaining wild grass prairies in the Puget Sound. In prehistoric times, Native Americans in the area harvested food plants like camas from the wet soils, and kept trees back by burning the prairie from time to time. Washington State still keeps back large shrubs and trees on the prairie with controlled fires, but visitors are more likely to speculate about the origin of the mounds covering most of the preserve. These mounds are round or teardrop shaped, and range from eight to 70 feet across, and from one to seven feet high. At one time, the mounds covered 20 square miles. Even now, there are thousands of them, and no one is sure how they came into being. Some people believe that these were Native American burial mounds. However, the local tribes do not have any legends about burying their dead there, and no one has ever found any human remains or tools in any of the mounds. Some traditionalists may still believe that Paul Bunyon created the mounds when he and his Irish laborers dug out the Puget Sound. They dropped the dirt from their wheelbarrow over the Mima Prairie, creating the mounds. Scientists developed several theories about how they formed. Some think a mild, sustained earthquake caused the soils to form the mounds. A soil scientist put soil similar to that of the Mima Prairie on a plywood board and started shaking it, which caused the soil sample to form small mounds. Another scientist measured the way moisture evaporates and saturates soils, called Evapotranspiration. At various times of the year the prairie soils soak with water. As the prairie dries out, the moisture evaporates differently through the various types of soils, causing the mounds. A favorite theory is that pocket gophers created them. Mounds like this have only been found on land where people have found gophers, or where gophers once lived. Scientists excavated several mounds and found evidence of extensive rodent tunnels inside the mounds themselves. Most of the soils in the mounds were small enough to be moved by rodents. They found some larger rocks, but they were usually located at the bottom of or in the center of the mounds. However, no one has found mounds like this made by modern gophers. And given the thousands of mounds, it would have taken a lot of gophers a long time to make them. It has been suggested that a combination of shaking and evaporation caused the mounds, which were then colonized by the gophers. 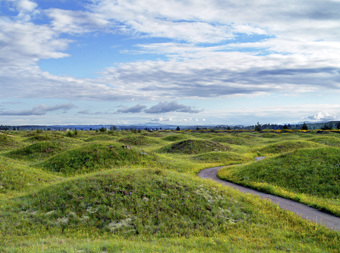 There are at least a dozen more theories about the origin of the Mima Mounds, including those popular on the Internet. Many people believed the mounds date to nuclear testing at the Hanford Nuclear Reservation. Moreover, there are some strange otherworldly things inhabiting them. They may have come from the asteroid storm that struck the earth, creating the mounds in the first place…like many stories, conspiracies abound. 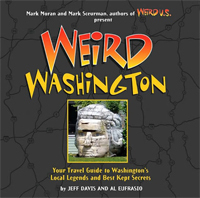 To develop your own conspiracy about the Mima Mounds: From I-5 Southbound, take exit 95, go west on Highway 121 toward Littlerock. In Littlerock continue west on 128th to the “T.” Turn right on Wadell Creek Road. The Mima Mounds entrance is about one mile ahead, on the left.